Kimora Lee Simmons will launch the second perfume in her Baby Phat line, Baby Phat Golden Goddess, in September. The fragrance "...is a floral gourmand scent by Firmenich with a top note of bubbling champagne; a heart of seringa, blue lilies and night orchid, and a drydown of caramel, vanilla flower patchouli and vetiver." Alabaster, a floral scent created by Honorine Blanc of Firmenich, has a top note of lotus flower, a heart of wild rose and a drydown of white amber. Jade, a floral-fruity scent by Beatrice Piquet of International Flavors & Fragrances, has a top note of tropical grenade, a heart of musky cotton flower and a drydown of kashmir wood. Rosewood, a floral-Oriental fragrance by Pascal Gaurin of IFF, has a top note of bergamot champagne, a heart of white tea leaves and a drydown of white amber. Slate, an aromatic green fragrance by Jean Marc Chaillan of IFF, has a top note of glacier citrus water, a heart of silver sage and a drydown of hydroponic ginger root. Black Walnut, an aromatic woody fragrance by Harry Fremont of Firmenich, has a top note of cognac, a heart of tobacco leaves and a drydown of cedarwood. 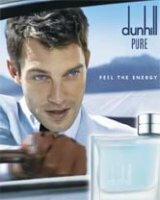 Dunhill Pure is available in 50 and 75 ml Eau de Toilette and in matching grooming products. Oh no, not another floral gourmand! Seringa, caramel, patchouli …yikes! Ah, the well-known citrus glacier. It sounds kind of like Avon Extraordinary, actually — that one has champagne & chocolate. I think I need to get this for March, I know how she loves all all things Kimora. I'm with you on this one M! yikes and yuck! LOL — then I'm sure she'll adore it. Well the Baby Phat one sounds fairly icky. I am excited about the Bananna Republic scents though. I adore “W” – one of my HG anytime, anywhere perfumes, and am curious to see what these smell like. The first three listed sound most intriguing to me. Whoever they hire to do their perfumes seems to do a really good job. I have enjoyed your delightful blog for sometime, so I thought I would join in. In recent months I have become a connoisseur of fine perfumes…an addictive but costly passion. I am not an admirer of florals at all, so anything gourmand tweaks my interest. However, I did buy Goddess to see why it was such a large seller. I knew it was a floral, but I bought it anyway. I think the white pepper makes it tolerable to me. I will buy the Gold; in fact, I can almost feel the money leaving my pocket now! Well, I am awaiting a shipment of another Bond No 9. so I will get some rest! And I am very intrigued by the men's, Slate especially. Happily, this will be one line that I'll actually be able to sniff in person. Welcome! If the notes of GG are appealing to you, do try Avon Extraordinary if you can. It is very well done and sounds similar, although of course, it may turn out that they're nothing alike. And enjoy your new Bond no. 9! Thanks for the welcome…I figured my obessive love would find consipirators…he, he! I should try the Avon perfume and not be a snob, but can I make a confession? I believe I fall prey to the snobbery appeal that markerters use. Not everyone can have a Bently, but if O magazine says that I should try three wonderful perfumes…oh, I almost forgot I have got to get the Joy somehow…I can go online that day to Saks a get the Missoni! I love it…Now I need to bathe in the perfume because I have so much…not good, huh? I gather many of you get samples so you don't end up like me with a bunch of perfume. In fact, a description does not a love make. Shape did a wonderful blurb on Jivago Connect, so parted with $95 dollars, and I don't like it…at least not until the dry down. It smells like hairspray when you first spray it…now that's a yuck! This crap smells EXACTLY like the first one!!! The first one smelled like plastic!! Like a barbie doll!!!!! You are a true hater! If you don't like it oh well! See if Kimora cares. I think golden goddess is a nice fragrance and also very long lasting. Actually better than the first one. It is fine to disagree with another reader, but please, try to keep it civil — there's no reason to call someone else a “hater” just because s/he doesn't like the same scent you do. InAMoment, I know its been a while since you posted this, but I'm just now seeing it and you were 100% right. It smells a lot better than the original.